We are a leading Manufacturer of upvc plumbing pipes, pvc pipe fitting, plastic cement, pvc solvent cement, upvc tee and upvc pipe fittings from Rajkot, India. 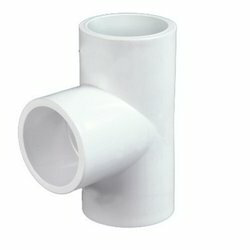 With sincere intentions to preserve and uplift our reputation in the market, we manufacture and supply a distinguished assortment of UPVC Plumbing Pipes. We Offer PVC Pipe Fitting to our clients. Used for fixing PVC Pipes. We Offer Plastic Cement to our client. 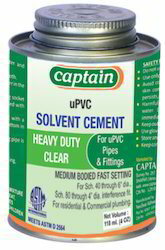 Used for fixing and joining the UPVC Pipes. We Offer PVC Solvent Cement to our client. Used for fixing and joining the pipes. Our organization has acquired one of the top most positions in the industry for offering UPVC Tee. The offered tee is tested on numerous quality parameters so as to deliver a flawless range. This tee is designed utilizing high material and advanced tools in adherence to set industrial standards. Patrons can avail this tee from us as per their necessities in various specifications. 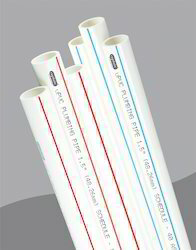 UPVC Pipe Fittings is mostly used for carrying Potable water.